Amatrol’s Temperature Process Control Learning System (T5553) teaches learners how to install, calibrate, operate, adjust, and tune thermal process control systems in a wide variety of industrial applications, including food processing, chemical manufacturing, and bio-technology. Process control systems provide precise control of liquids and gases. 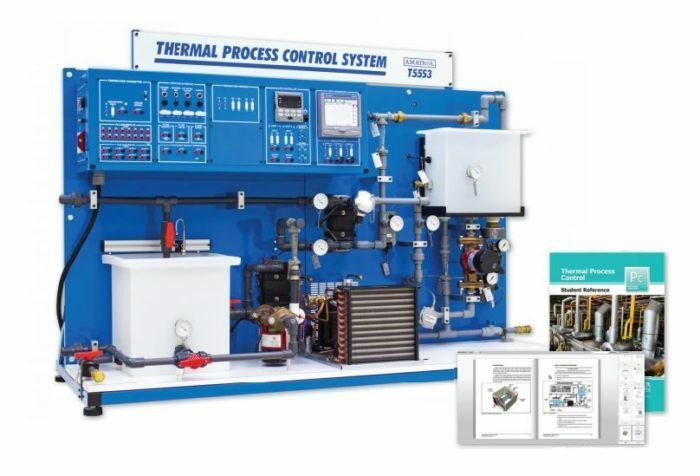 The Temperature Process Control training system features a heavy-duty, welded-steel workstation with industrial-quality components, which are mounted and plumbed in two water flow circuits, a process loop, and a heating loop that controls the temperature of water flowing in the process loop. All electrical components are connected to the control panel to allow learners to measure signals and connect the devices in a wide variety of control configurations, including PID control, on/ off control, and manual control. Amatrol’s Temperature Process Control training system features an impressive variety of real-world components, including: a chiller that mechanically refrigerates the process fluid; three types of temperature sensors: thermocouple, thermistor, and RTD; a heating loop network; and an operator interface station. The system allows learners to observe what is happening inside the system, so they can evaluate the effects of external disturbances and their own adjustments. Learners will practice a variety of real-world skills, such as: control water temperature using a sensing bulb thermostat; connect and operate a loop controller in the manual mode; calibrate an I/P converter; connect and configure a temperature transmitter for a thermocouple; and configure and operate discrete inputs on a Honeywell UDC 3500 controller. The Temperature Process Control training system includes an in-depth, comprehensive curriculum that provides a strong foundation in temperature process control, including these major topics: process control concepts and safety; instrument tags; piping and instrumentation diagrams; thermal energy; basic temperature control elements; loop controllers; final control elements; temperature sensors; temperature transmitters; basic temperature control; methods of automatic control; and control loop performance. The curriculum also features over 50 hands-on skills to prepare learners for real-world situations. The curriculum is also available in a convenient eBook format with enhanced features like keyword searches and zoom controls that enable users to quickly locate and view information. The Temperature Process Control training system features two options for expansion. The optional Three-Channel Data Acquisition Learning System (T5553-R1A) teaches the fundamentals of data acquisition, including topics like: digital chart recorder menu, navigation, and configuration; thermocouple application; RTD application; and voltage/current applications. You can also add the optional Two-Channel Temperature Transmitter Module (T5553-T1) to provide two additional temperature transmitter channels. A sample copy of the Thermal Process Control Student Reference Guide is also included with the system for your evaluation. Sourced from the system’s curriculum, the Student Reference Guide takes the entire series’ technical content contained in the learning objectives and combines them into one perfectly-bound book. Student Reference Guides supplement this course by providing a condensed, inexpensive reference tool that learners will find invaluable once they finish their training, making it the perfect course takeaway.